This program features a series of print advertisements, product literature, sample kits and a new 20-foot by 20-foot trade show booth in which legendary graphic arts icons — such as the Eiffel Tower — are re-created and/or displayed with one of 3A Composites’ leading graphic display boards, including the Sintra, Dibond, Gator and Fome-Cor board lines. The “Legends” marketing campaign was developed as a result of the 3A Composites, Inc., acquisition of the Uniwood/Fome-Cor Board business from Nevamar Company in October 2003. “Both of our businesses offered leading brands of graphic display boards backed by outstanding customer and technical service,” said David Meacham, marketing manager, 3A Composites USA. “Together, our product offering — including Sintra, Dibond, Fome-Cor and Gatorfoam graphic display boards — is stronger than ever before. 3A Composites USA now is a single source for graphic display boards, offering everything from paper-faced foam boards to expanded plastic boards, aluminum composites, polyurethane foam boards with melamine-impregnated liners, and polystyrene foam boards with wood-fiber veneers. The “Legends” campaign was developed for 3A Composites by McLane & Company, a full-service marketing communications firm based in St. Louis. Sintra, the trusted brand leader in premium graphic display boards, was selected to create a 6-foot-tall tower display — a scale of 1/182 of the real Eiffel Tower. Sintra is a lightweight-yet-rigid expanded PVC material that is available in a wide range of thicknesses from 1 mm to 19 mm in various sheet sizes and a rainbow of colors. Sintra cuts cleanly, creating smooth edges. It can be direct printed and screen-printed and can accept vinyl graphics. Sintra fabricates easily without special tools and can be heat formed and laminated to other materials. Architectural Signage, Inc., in St. Louis, began fabrication of the display by scanning an intricate paper model of the Eiffel Tower into Adobe Photoshop and re-sizing the image to a 6-foot final height. Vector paths of the artwork were created along all parts to be routed. “We created print files of each filigree, nut, bolt and rivet,” said Ed Brimer, president of Engraphix. Engraphix contracted DAXAM, Inc., in Chicago, to print and rout the image. The digital print files were first sent to the Onyx Production House rip server. Finished files were sent to a Zund UV jet 215C printer, utilizing Sericol UV curable inks. The image was direct printed four times — to create the four-sided tower — onto 3 mm and 6 mm beige Sintra graphic display board. 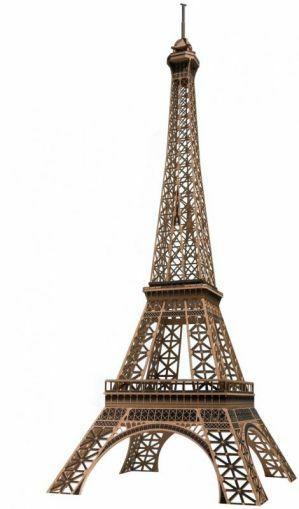 Beige Sintra was selected to most closely match the current painted color of the Eiffel Tower. A Zund L-2500 plotter, operated by MGE i-cut digital die-cutting software, was utilized to rout the intricate images printed on each board. 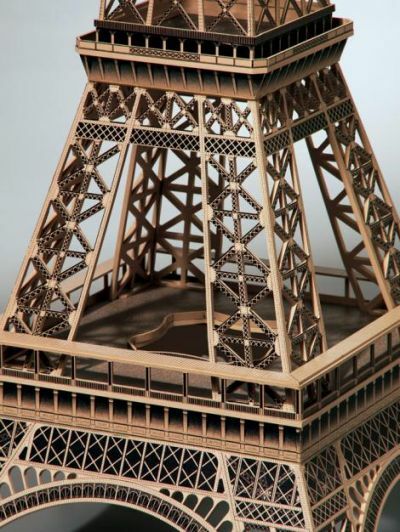 The Eiffel Tower image was returned to Engraphix in 84 pieces for assembly as a four-sided tower. The edges of the main structure were cut with a 45-degree bevel and glued with Lord Urethane Adhesive 7542A/B. Most corners on the peak were formed using relief cuts on the back and heated to make a smooth bend. Small pieces of low-tack tape were used to hold the structure together while the glue cured. The tower can be disassembled into three main sections for transportation to trade shows. While construction of the real Eiffel Two required two years, two months and five days to complete, fabrication of this lifelike display was still no easy feat. In addition to file preparation, print and routing time, it took one Engraphix employee, who builds models as a hobby, nearly three days to trim, bend and assemble the tower. The 6-foot-tall Eiffel Tower display made its debut at PMA 2004, sponsored by the Photo Marketing Association International in Las Vegas Feb. 12-15. Placed strategically in front of the new 3A Composites island display, the Eiffel Tower served as a successful draw for show-goers. In addition to the Eiffel Tower display made of Sintra, the new booth created by Pingel Displays, Inc., in St. Louis, also utilized Dibond aluminum composite material in the main tower and to mount signage. Nimlok Displays & Exhibits Worldwide of Niles, Ill., fabricated the trade-show booth, incorporating both Dibond Butler Finish material and a powder-coated metal extrusion. Dibond is a lightweight-yet-rigid durable aluminum composite material consisting of two strong sheets of .012-inch aluminum bonded to a thermoplastic core that fabricates easily. Dibond can be used in large-format digital and electrostatic printing and photo mounting applications, as well as screen-printing. A polyester clear coat is applied over Dibond’s brushed aluminum finish to create Dibond Butler Finish. This product offers significant cost savings, fabrication ease and rigidity for interior signage, exhibits and displays.